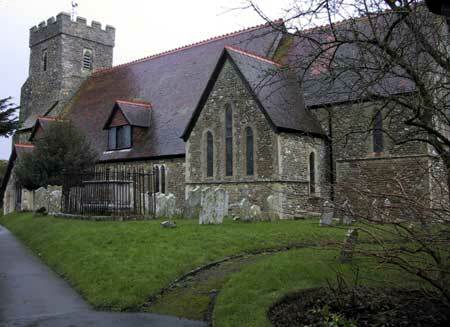 This church lies just south of Chichester. Although mentioned in Domesday Book and in the 12th century its patronage was the cause of a major dispute between King Henry II and Archbishop Thomas Becket. Little of the church today dates from that early period. The arches supporting the roof are 13th century Early English whilst the impressive 52 feet high Perpendicular tower with its battlemented parapet dates from 1500, but most of the rest of the building dates from a major Victorian restoration of 1883. Nevertheless at the entrance to the porch a very weather beaten carving can be seen of the Virgin and Child. It is dated 1497. Once inside the door, one's eye is caught by a modern painting, some six feet tall, showing the martyrdom of St Stephen, but the main impression looking around the nave and chancel is of a typical Victorian church. The one exception, is the large font cut from a single block of Sussex marble, some 3½ feet across. It is probably of Saxon origin though the carved oak cover was made in 1887. The chancel screen, designed by Blomfield the architect responsible for the Restoration, is a good example of Victorian ironwork. More unusual is the reredos behind the altar, an Italian painting on wood, the middle panel showing Christ at Emmaus. Three dormer windows in the nave, dating from 1889, are very attractive and contain glass by Burn-Jones. They show nine, mostly Old Testament figures. The north side window depicts Abel, Stephen and Zacariah, whilst opposite on the south side are Abraham, Moses and Joshua. Finally high up near the west window one can see Isaiah holding the scrolls, David carrying a harp and St John the Baptist with a staff. The west window itself, which can only be seen by ascending to the gallery, shows the three Marys - Mary of Bethany, Mary Magdalene and the Virgin Mary. Behind the north choir stalls is hidden the large tomb of Thomas Bowyer a London merchant who died in 1558. The crosses at the corners may indicate that the marble slab on the top was once the pre-Reformation altar. His lawyer son, another Thomas, exiled for many years in Elizabeth's reign, is commemorated on a tablet on the north wall. Perhaps the most interesting memorial is that of John Bigs of Portsmouth who died aged 17 in 1634. As I am so shall yee bee". Underneath the following verse is carved. That when he calls thou mayest be fit to goe". Another 17th century memorial is a brass on the nave floor to Robert Birch of Eastergate who died in 1675. The list of Vicars on the south wall begins with William Dons 1222. He was apparently known as 'the wicked vicar of Mundham' as he had two wives. 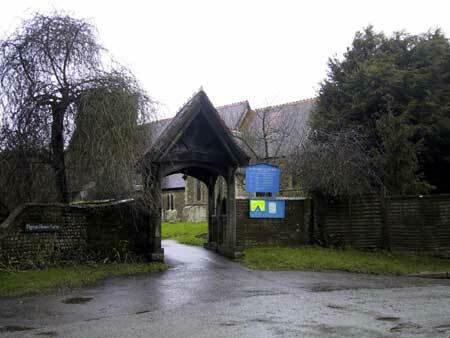 On that cheerful note one can leave the church and stroll into the churchyard towards the attractive Lych Gate erected in 1887 to commemorate Queen Victoria's Golden Jubilee at a cost of £50.